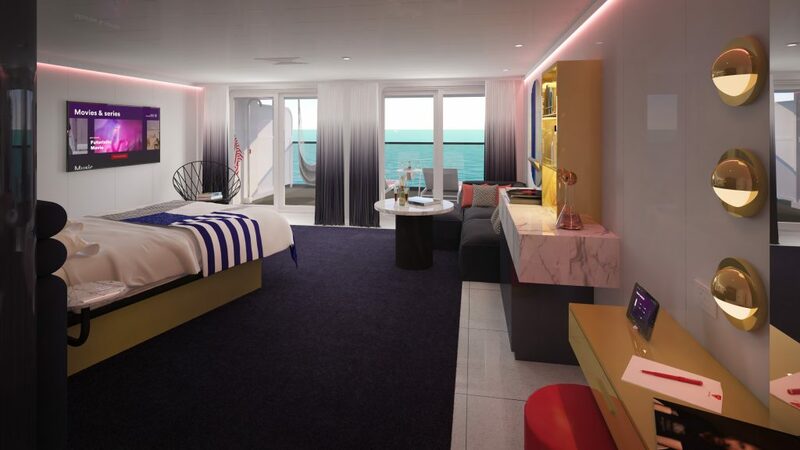 Virgin Voyages today released several designs and images of their RockStar Suites. The cruise line is throwing out traditional clichés on luxury and formalities, instead bringing Rebellious Luxe to life at sea with their ‘RockStar Suites,’ designed by Tom Dixon’s Design Research Studio. 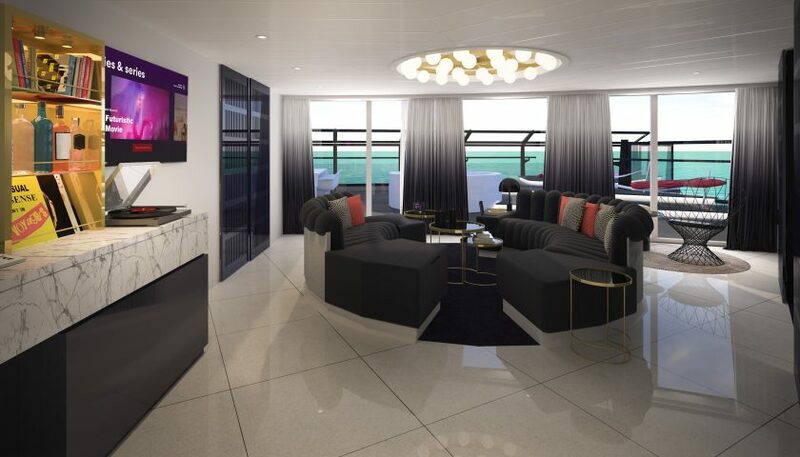 “We have combined brilliant design and Virgin Voyages’ epic Sailor experience vision to create a completely new version of luxury – Rebellious Luxe. 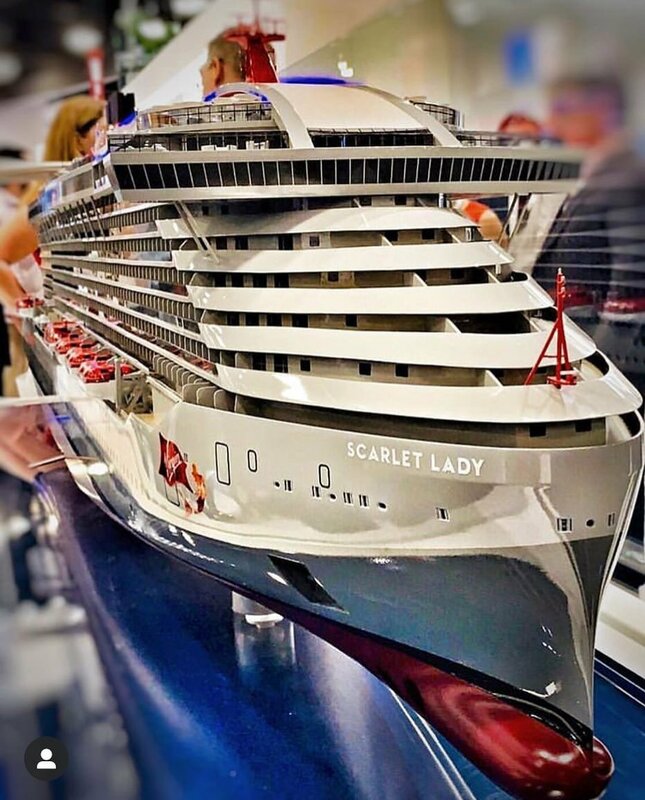 Whether they want to sleep all day, praise the sun with yoga at dusk or party all night, our RockStar Suite Sailors can live out their fantasies aboard the Scarlet Lady,” said Tom McAlpin CEO of Virgin Voyages. Virgin Voyages’ RockStar Suites bring a fresh take to yachting glamour. Inspired by mega yachts and rock and roll style icons like Grace Jones, the RockStar Suites feature Tom Dixon’s iconic retro-futurism designs with a palette of deep blues, used with iridescent dichroic elements, to echo the colours of the sky and sea. Touches of yacht materiality are sprinkled throughout the suites with real leather finishes, marble-clad bathrooms and Terrazzo flooring. The suite’s design features nautical nods with a brass glam station, accenting beauty counter and bedhead lighting. The supremely modern suites boast high-quality design elements and bespoke Tom Dixon furniture pieces. Because music is the soundtrack to the soul, each suite is equipped with a vinyl turntable. With suites situated at the top of Scarlet Lady, RockStar Suites Sailors will have the best view that money can buy. All suites will be purposefully configured to maximise the view of the ocean. 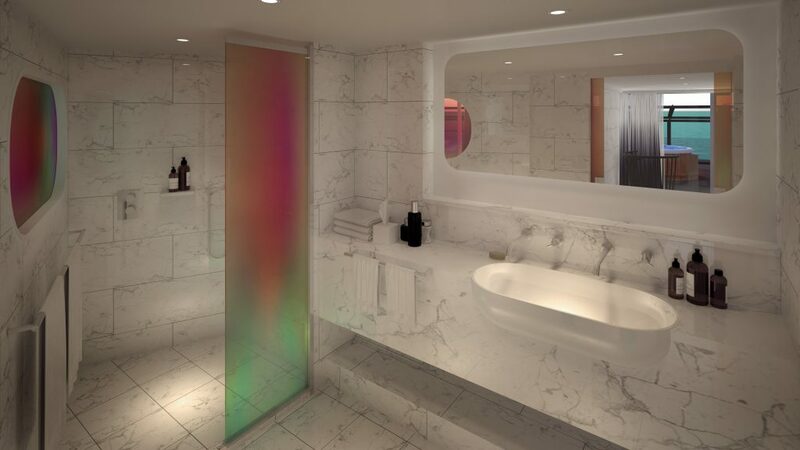 Many will feature a Peek-a-Boo shower, which is an all marble shower with a dichroic glass window carved in the centre, so Sailors can always look out at the ocean. Rockstars who opt for the ship’s top Mega RockStar Suites, can bathe under the sun or stars with their very own Peek-a-View outdoor shower. Because a rockstar can never have too much champagne, the sea terrace for each suite will feature a specially-designed champagne table where an ice bucket fits perfectly at the centre of the table, situated next to stargazing loungers, and sustainably sourced terrace hammocks. RockStar Suites Sailors will be taken care of by the RockStar Services Crew, from time of booking and throughout their voyage. 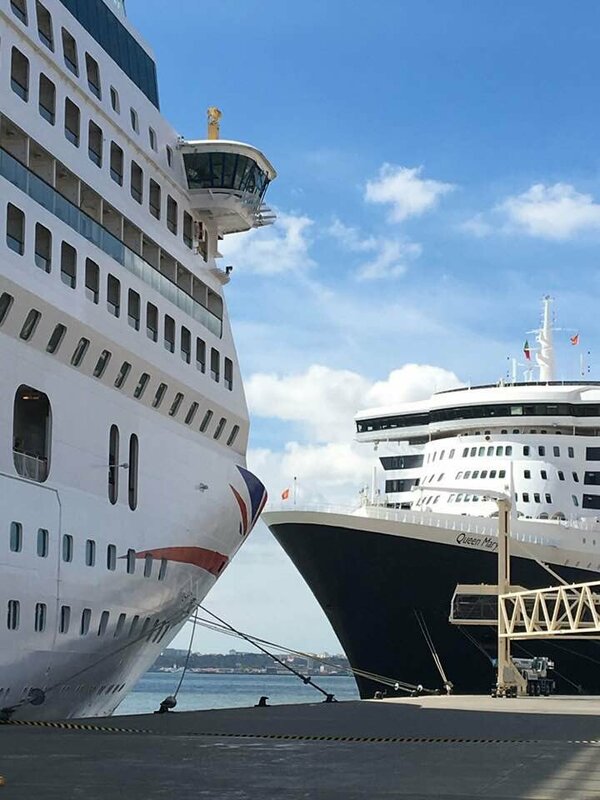 There will be backstage access for RockStar Suites Sailors, with early access to onboard entertainment, restaurants, Shore Things, a private transfer to and from the ship in Miami and an exclusive express VIP pathway to the ship during embarkation. Sailors will have their own wardrobe team to help unpack and repack, complimentary pressing service and nightly express swimsuit drying service – because no Rockstar should ever have a wet bottom. In Rebellious Luxe fashion, Virgin Voyages has reimagined the mini-bar for its rockstars. Suites will have a full bar and cocktail kit, with the first round on the house. 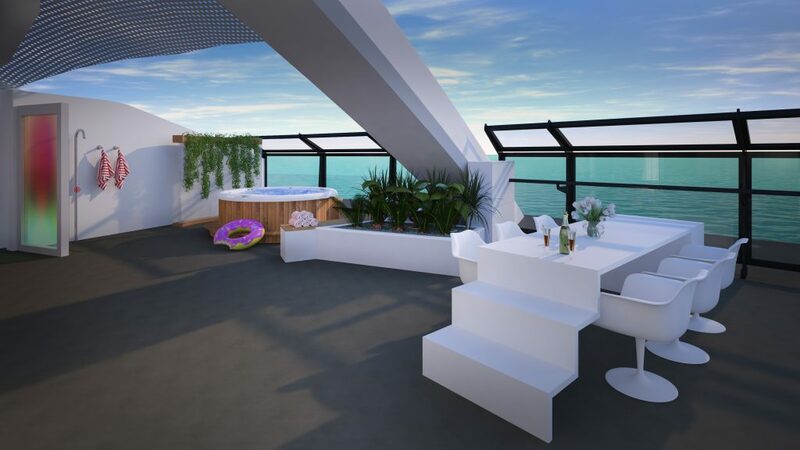 All RockStar Suite Sailors will have access to Richard’s Rooftop, their very own private members club – a secluded place for them to bask under the sun or have a drink under the stars. All suites are clever cabins, with mood lighting that automatically adjusts to match the time of day and there will be in room tablets that allow you to adjust the room’s lighting. Sailors will enjoy luxurious comforts like premium linens and a plush king size bed, as well as upgraded bath amenities for pampering. There will be 78 RockStar Suites on board Scarlet Lady. 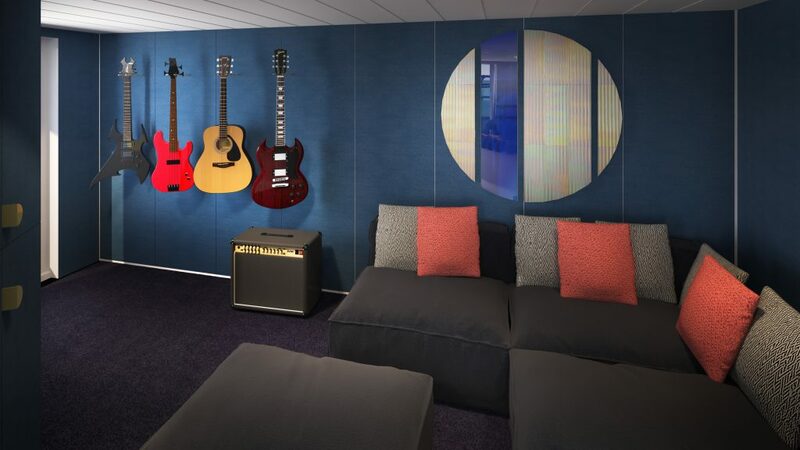 Sailors looking to up their holiday game can opt for one of Scarlet Lady’s Mega RockStar Suites, located on deck 15. Mega RockStar Suites will receive a personalised bar filled with their favourites, and the RockStar Services Crew will tend to their Rockstar rider list. 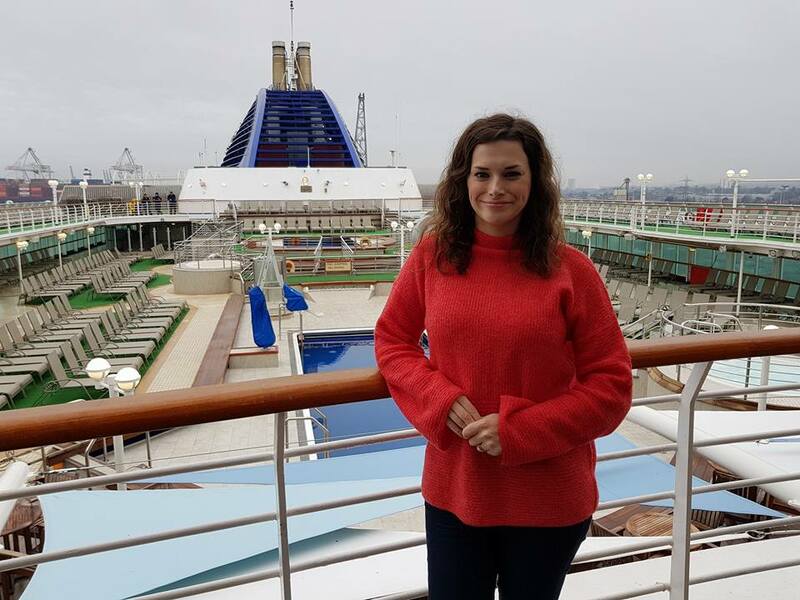 There are only two Massive Suites aboard Scarlet Lady, with each suite sitting above the ship’s bridge. These 2,147 square foot suites have their own music room, which doubles as an extra bedroom. At the centre of the Massive Suite is a circular oversized couch, perfect for conversation and cocktails from the suite’s adjacent in-room bar. Rockstars can relax in the suite’s glamorous bathroom and dressing room area complete with a hot tub, vanity area, two full-sized wardrobes and a marble-clad bathroom with a Peek-a-Boo shower area, that overlooks the bedroom and ocean. The Massive Suite’s larger-than-life terrace will be where friends and family can enjoy a private hot tub, a Peek-a-View outdoor shower, a circular conversation pit, a lookout point with stargazing loungers and two full length hammocks. Sailors in the Massive Suite can climb a staircase to the top of the runway outdoor table for dining and dancing. An open wall separates the space in these suites into bedroom and living areas. The living area features room for friends, with a sofa that converts to sleep two, an extra half bathroom and an entertainment credenza. The suite bedroom area features a large wardrobe, while sunning on the terrace is encouraged with a Peek-a-View outdoor shower, stargazing loungers, a sofa, a terrace hammock and champagne table. 950 sq. ft, sleeps up to four. This suite can sleep up to four with separate living and bedroom areas. Some suite highlights include a convertible sofa, an extra half bath and a terrace with a Peek-a-View outdoor shower, stargazing loungers, a sofa, a terrace hammock and champagne table. 833 sq. ft., sleeps up to four. This huge suite features an open floor plan with a lounge and bedroom areas, plus a luxurious marble bathroom with Peek-a-Boo shower window, and an expansive terrace with a Peek-a-View outdoor shower and more. 570 sq. ft., sleeps up to four. A brilliantly designed suite with an open floor plan. With all of the action facing the sea, this features an in-room fully stocked bar, a large convertible sofa, an in-room glam brass vanity station, a Peek-a-Boo shower window, terrace sun chairs and more. 481.7 sq. ft, sleeps up to four. The perfect suite for those looking to enjoy sunrise yoga on their expansive terrace. This suite features a bedroom overlooking the wake of the ship with a large wardrobe for extra space, corner sofa, an in-room glam brass vanity station and more. Sq. 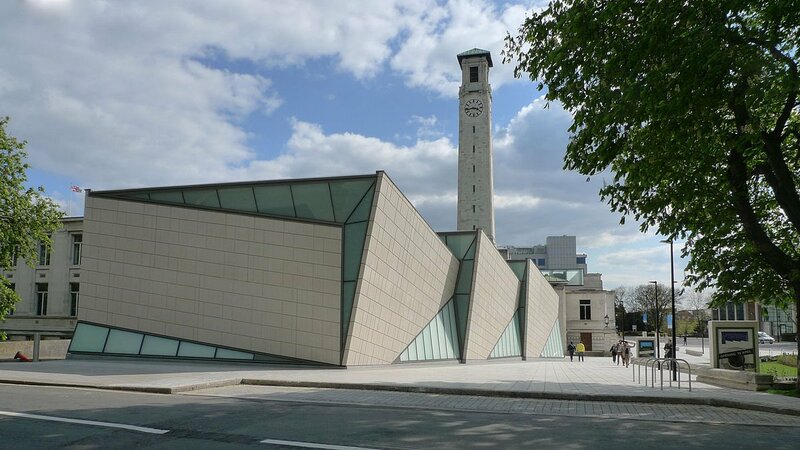 ft varies based on terrace size, sleeps two. The most popular RockStar Suite, this space features a fully stocked bar, a plush king size bed, a Peek-a-Boo shower window, a terrace hammock and more. 352 Sq. ft, sleeps two. Positioned centrally at the aft end of the ship, these suites provide the most photographic wake view. Sq. ft varies based on terrace size, sleeps two. 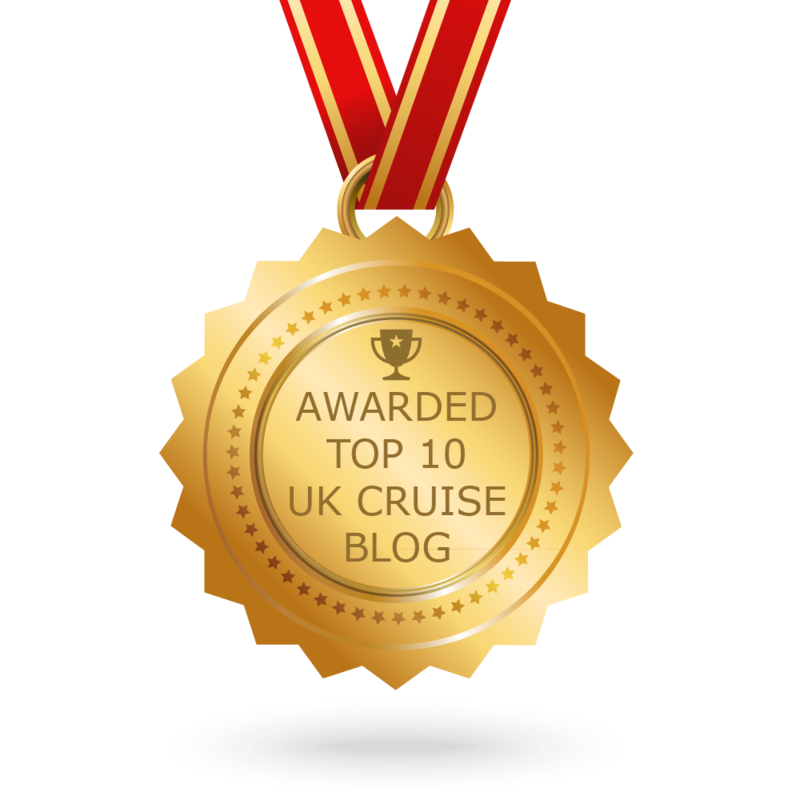 More information about Virgin Voyages can be found on their official website.